This apartment is one of five (including two penthouse apartments) in an ancient building that can be booked together to accommodate a large group of family and friends. Located just minutes from the famous Campo dei Fiori, or "Field of Flowers" a name that was given to this area in the Middle Ages when it was a meadow. Since 1869, the Campo is transformed each morning into the fish and vegetable market attracting homemakers, chefs, and tourists alike. The ancient fountain that was once used to water cattle now keeps flowers fresh. 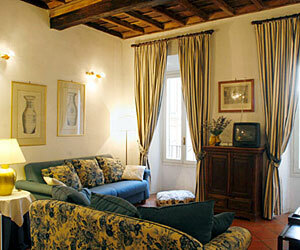 The Campo dei Fiori area is centrally located in the historic center. The Piazza Navona and Pantheon can be reached in under 10 minutes, while the Spanish Steps and Piazza del Poplo are a leisurely 20 minute walk. You can easily walk over the bridge to Trastevere in 15 minutes and Piazza Navona in the other direction in the same amount of time..
Take the staircase or the elevator to the first floor. Enter into the warm foyer with silk panels on the walls. On your left is an open floor plan that consists of a living room area with two comfortable sofas ( one is a sofa bed that can accommodate two guests) and kitchenette with a built in island table for dining. Straight ahead of the foyer is a twin bedroom, a hallway to the left takes you to a bathroom with shower on your right. Further down the hall is a double bedroom on the left and a bathroom with tub on the right. A door in the hall way gives the double bedroom privacy and an 'en suite' bath.